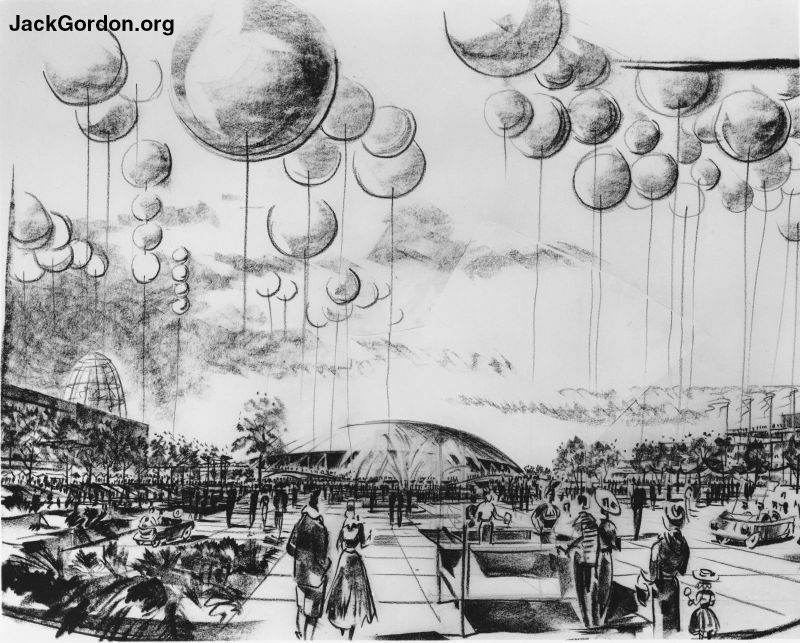 So you think you know what the World's Fair -- Seattle's Century 21 -- looked like? And therefore what today's Seattle Center's layout is? Well, read on. Hiding in one of Jack Gordon's file cabinets in a drawer labeled "correspondence" were these nine drawings. There was nothing in the file folder describing them or their source and nothing stamped or printed on the reverse giving a credit to anyone. Aside from their obvious pre-Century 21 dating, I have no idea from whom or where they originated. Presented here in the order in which they had been stored for close to 50 years are these "Futuristic Previews of Century 21." 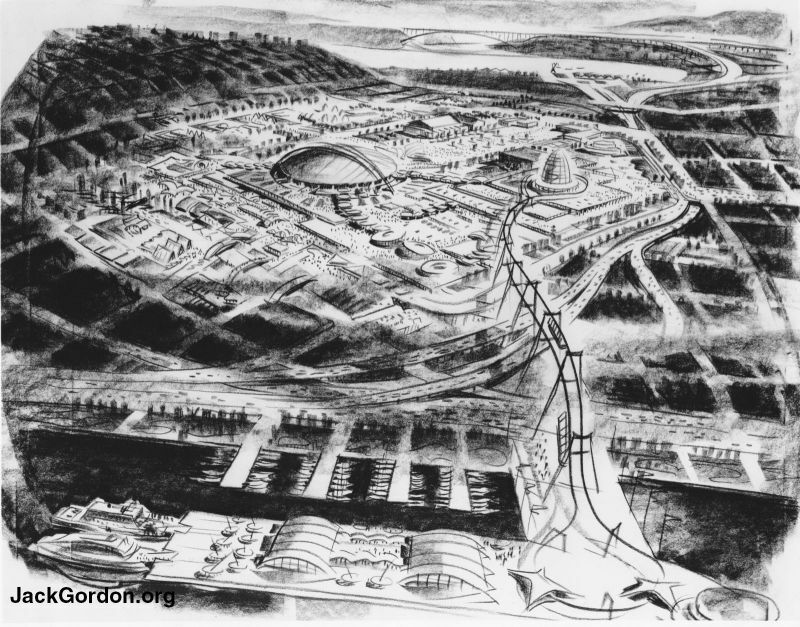 Jack Gordon was appointed a consultant to the U.S. Department of Commerce by the Kennedy Administration for preparation of the Seattle World's Fair. He created and implemented the idea of the Plaza of the States and served as Plaza Coordinator for Washington's Gov. Albert D. Rosellini. 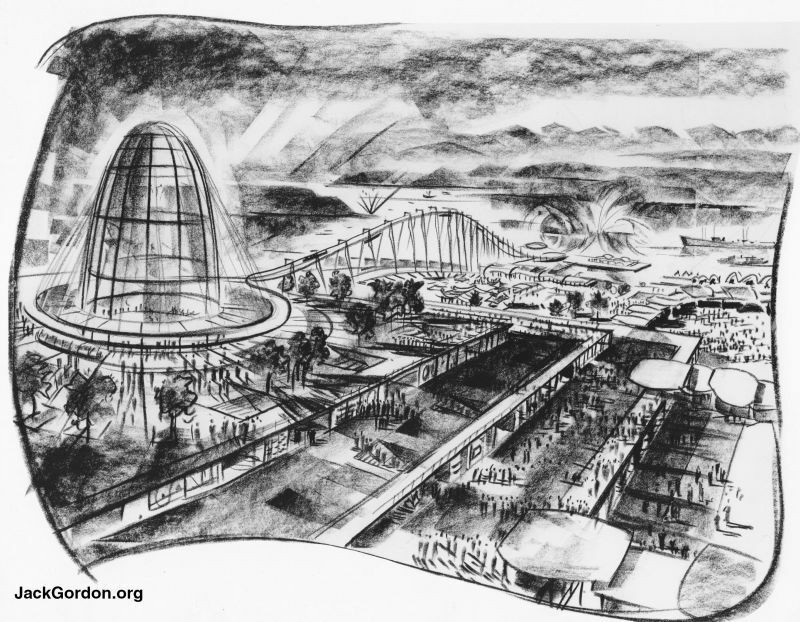 We start this tour with an interesting view of the potential World's Fairgrounds that, like several other drawings below, plays around with perspective and geography. Don't bother looking for the freeway. 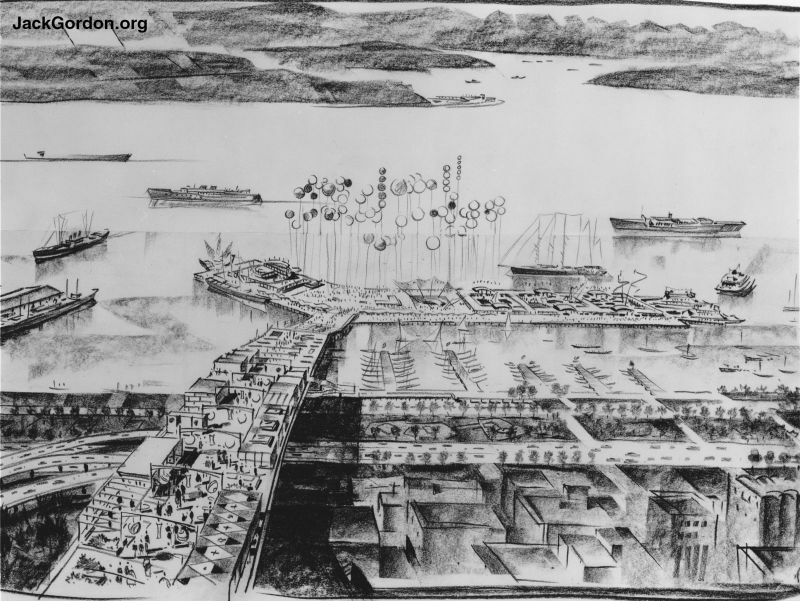 Remember, this was a Seattle with no I-5, no 520 Floating Bridge. The Alaskan Way viaduct along Seattle's downtown waterfront wasn't even 10 years old. 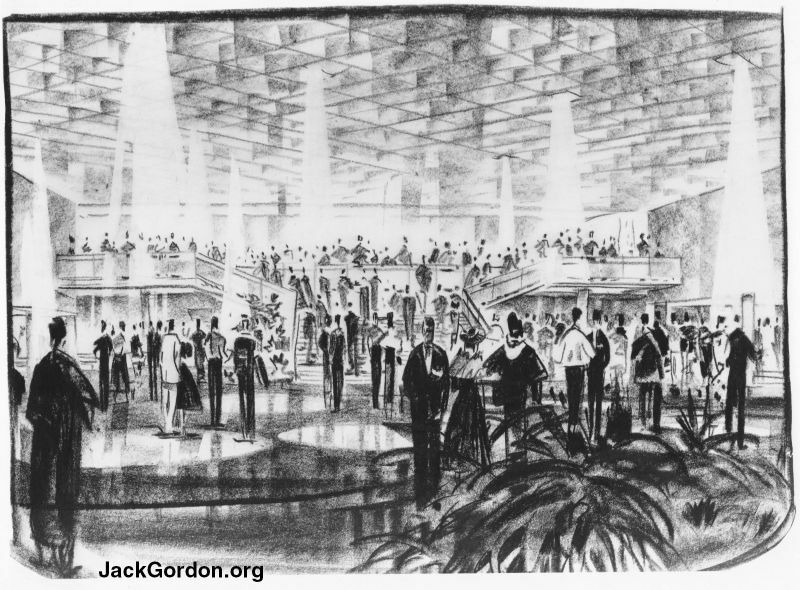 (And yes, Jack Gordon was involved in commemorating its opening). The main way in and out of the city was Aurora Avenue (Highway 99). The Aurora Bridge in the far distance celebrated its 30th Birthday a couple of months before the Seattle World's Fair opened. The domed building appears where the Coliseum (home of the Seattle University Redhawks, formerly known as the Chieftains) now sits. That looks like the International Fountain at the end of the walkway. That would put us east of the Coliseum and ready to walk through what ended up the Plaza of the States. How very fitting. The egg shaped object to the left turned into the Space Needle. And the artist liked balloons. 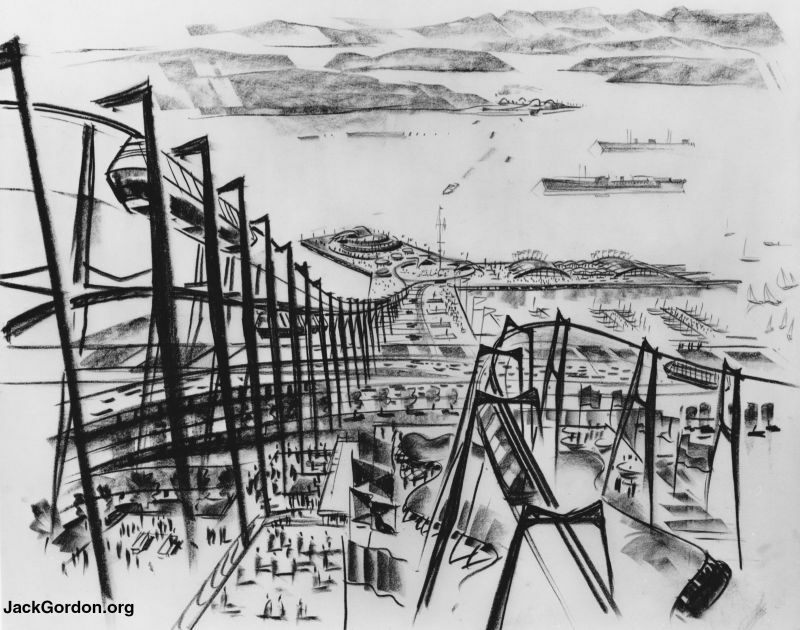 I date these drawings as from 1959-early 1960, because of a September, 1960, article by Stanton Patty in the Seattle Times that describes and illustrates a tall 500-foot "Space Needle." Like something out of an Escher drawing. I think I prefer the way the Monorail ended up. 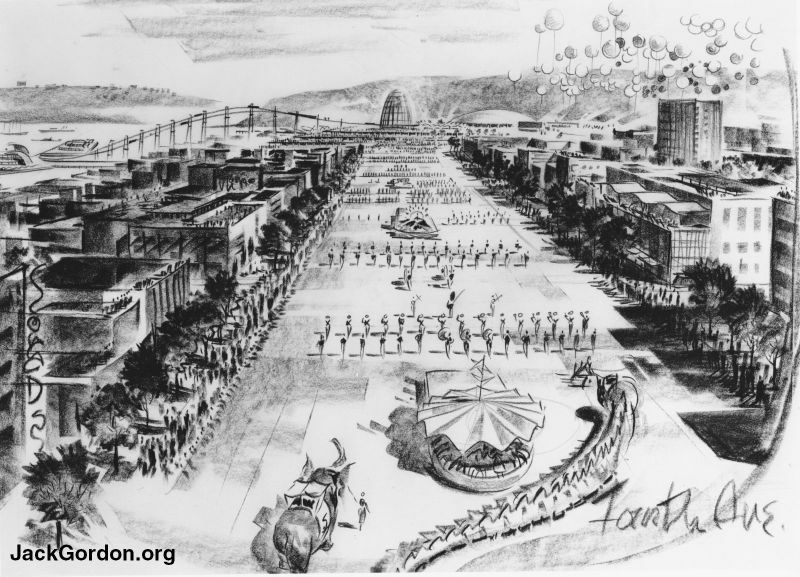 Tying in Seattle's maritime heritage with the World's Fair was a common theme in these drawings. Here's another, quieter view showing the potential water aspect of the Fair. The balloons show up again. It appears that the pavilions and displays are on top of a wide (100 foot?) platform that projects over the streets and runs down to Elliott Bay. This picture shows an "overhead view" of a Fairgrounds in almost exactly the same place as Century 21 ended up with the long platform heading west to Elliot Bay. 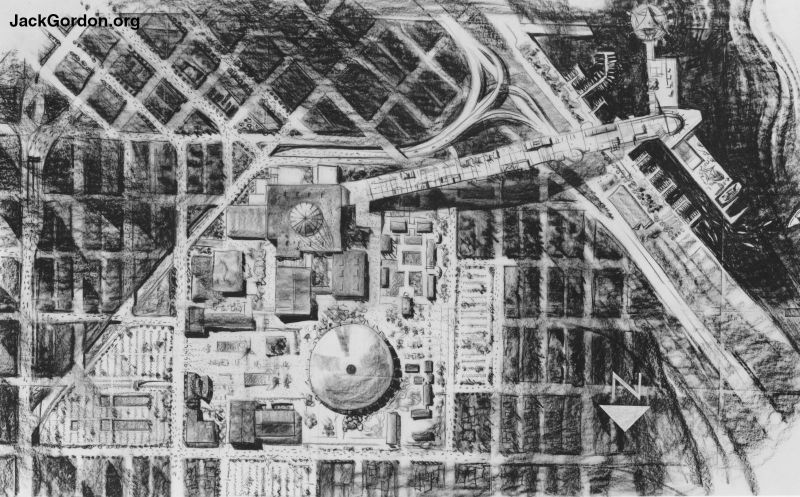 The "Coliseum" is round and the "Space Needle" is short and square. It looks like there's no Memorial Stadium, but I'm not sure. From the "map" in the previous picture, we that the egg shaped building above is located where the Space Needle ended up. It looks like the end or beginning of some kind of transportation or ride. It looks like a cocktail party from an early episode of "Mad Men." 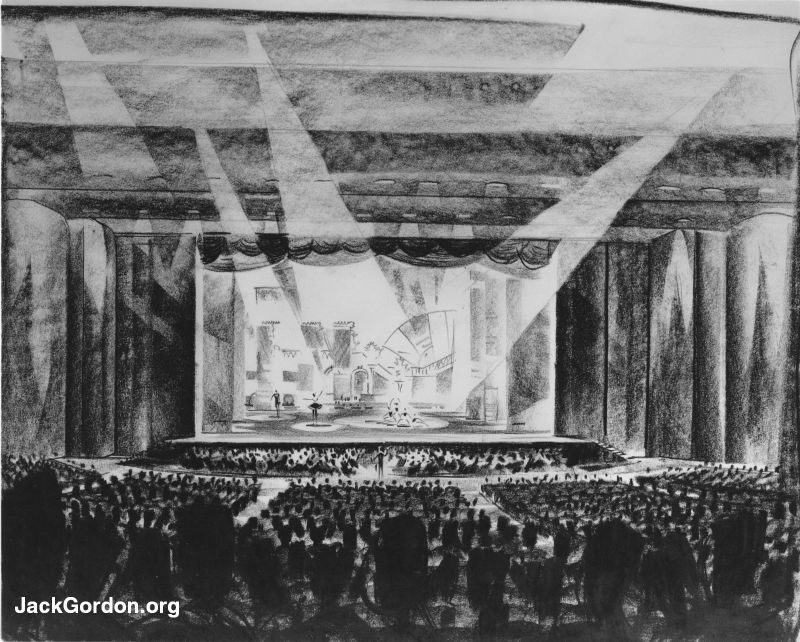 Possibly the early idea of the Opera House? We end looking north along Seattle's Fourth Avenue from maybe Virginia or Lenora Streets. The egg shaped structure stayed where today's Space Needle ended up. Note the balloons. Someone sure liked balloons.